A man has died in an accident involving a bus and a tram in Croydon. The crash happened at about 1000 BST on Sunday in George Street. The driver of the bus was taken to hospital. Six other people also went to hospital with injuries described by police as "non-critical". Two shop fronts and a BMW car were also damaged. 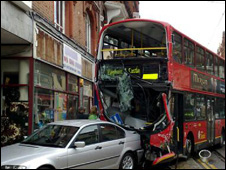 Transport for London said: "Following a collision involving a route 468 bus and a tram, a person has been killed. We will carry out a full investigation." Their statement went on: "Our deepest sympathies are with the family and friends of the person who died and those who were injured. A Scotland Yard spokesman said the man who died was believed to be in his late 20s. Police were contacting next of kin. He appealed for witnesses to the accident to contact police. Some roads in the area were closed while investigations were carried out.